Maria Cate has always hoped to leave a mark with her art. As a child, she did so by creating comic books and passing them out to family and friends. Today, Cate shares her art with different strategy through a business she calls Twisted Hand. Twisted Hand was intended to be a way for Cate to get back into drawing while she was in college—but posting her work on social media transformed Cate’s art from just another hobby to a viable business. The work of this University of Tampa student stands out from other local artists’ for its collaborative approach; all orders are made entirely by request and no two are the same. Canvases, phone cases and clothing are personalized with a favorite quote or image selected by the customer. The rest of the design is up to Cate’s imagination, usually including her signature flowing shapes and precise details within larger images. Alongside regular orders, she has also been asked to design logos for local businesses, some of which have bought the rights to her art. Balancing a business with schoolwork and law internships is no simple feat, but Cate finds the work is worthwhile when she can use her talent to represent something important to her customers. 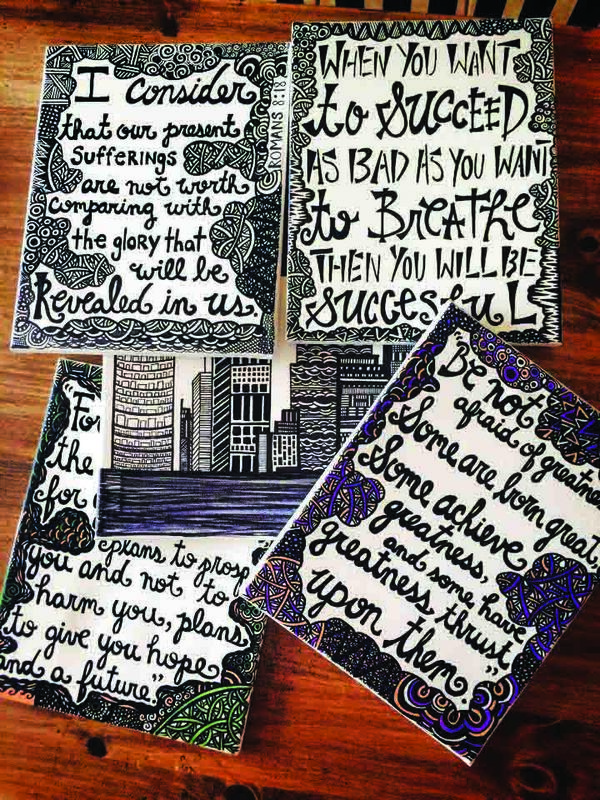 “Decorations are a constant reminder of a person’s favorite theme, quote, Bible verse…it means so much to me that they asked me to put something that means so much to them on a canvas to look at every day,” she said. Although Cate aims to pursue a career in law, she still plans to keep art a large part of her life. Samples from Twisted Hand can be found at www.twistedhand.net. To place an order, call 395-3279 or e-mail MariaCate20@gmail.com.